Whenever a good game is ported to the Wii, we tend to ignore it simply because the Wii port won't be as powerful nor utilize the Wii's capabilities. Visceral games has taken their passion for co-op gaming, and applied it to the Wii version of Dead Space dubbed "Extraction. Dead Space: Extraction doesn't try to be a clone of Dead Space. Instead, it is a prequel to the series in the on-rails first person, complete with Co-op before the Ishimura ever meets Isaac Clark. With the push of a button, I was able to join a single player game of Dead Space: Extraction, with access to all of the unlocked items the first player already had. We went through a cut scene with a new female protagonist, and went on our first rescue mission after the dreaded Necromorphs started trashing your ship. As with the first game, it's beneficial to incapacitate your enemies (blow off limbs before aiming for the kill shot) as you will be swamped relatively quickly. You're each given 3 stasis shots a piece that recharge over time, so to make the best use of that shot you should be alternating between both players. 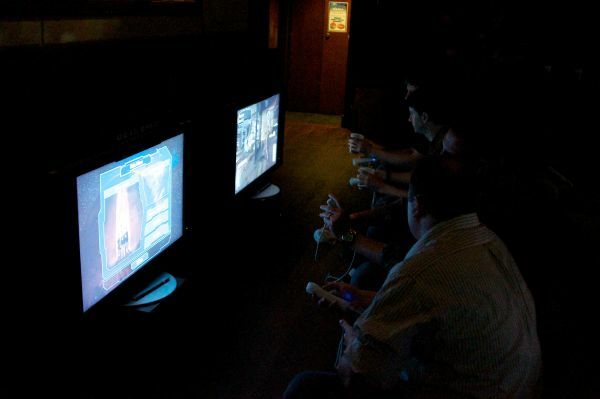 Given the general audience of the Wii, there are options to help out the other players more or less based on their skill and yours. If your player 2 is struggling with ammo, you have the option to share ammo between the two of you, or you can be an ammo hog and keep it to yourself. Both players health is shared outright, so it's beneficial to pick up as much health as possible to heal your collective health bar (and share your ammo so your player 2 can help cover you.) Picking up health and ammo is as simple as hover overing it and clicking a button. Unlike the House of the Dead style games, Dead Space: Extraction sticks closer to the survival horror side of the on-rails shooter. You'll get limited ammo and health items along your route, and the Necromorphs move a lot faster toward your location. Unloading on a single Necromorph is not a good idea, since there are usually 5 more immediately behind it. To balance your limited ammo, you're given a melee attack for those enemies that get a little too close for comfort - I used this often, but I'm also a sucker for melee in shooting games. Melee attacks are done in familiar Wii-waggle fashion of slashing the nunchuck attachment. The horror aspects in this game were very well done with enemies popping out, mild hallucination with a voice in the main characters heads, visual changes, and lighting changes. I was wholly entranced by Dead Space: Extraction and the little bit of story we saw, enjoying every minute of my time with the game. Aside from the straightforward Co-op story mode, there was an unlockable challenge mode for those that enjoy high-score races. This mode can also be played co-operatively for a combined score. These levels were based on the single player levels of the game. The other great bonus for playing through the game was the unlockable animated comic that was part of the game. We didn't get to take a look at any of that, but it was a 6 part mini-series that will fill in some more details on the series. While Dead Space: Extraction isn't even the same style of game as the original Dead Space, it fills its own role nicely on the Wii. A producer for Visceral games told us that cooperative gaming is something that he absolutely enjoys, and they took special time and care with making the co-op experience in Dead Space Extraction as tight and fun as possible. After our play session with the game, we can't help but agree. Page created in 0.7412 seconds.